The CeMEB LabEx is governed by several structures. COUNCIL OF INSTITUTIONAL PARTNERS - Composed of a representative of each institutional partner (12 members) and chaired by the University of Montpellier, the council provides strategic and operational advices to Cemeb. It reviews the achievement and projects of Cemeb, and approves budget allocation. It meets once a year, in presence of (among others) representatives of the Region Occitanie or of the French ministry for research. SCIENTIFIC COUNCIL - Composed of 10 members (foreign and French renowned researchers, representative of strategic non-academic partners and other Labex), the scientific council analyzes the strategy and activities of Cemeb, suggests developments and innovation, especially in an international perspective. It takes part in the evaluation of some projects. Meets once a year. 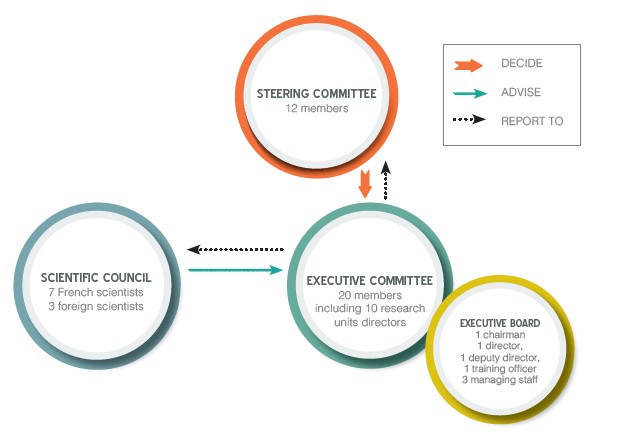 EXECUTIVE COMMITTEE - Composed of the 10 directors of research units, of 10 members elected among staff of the Cemeb community, and of the executive board, it meets 5 to 8 times per year. The committee discusses all aspects of Cemeb life (strategy, policy and activities). It takes part in the evaluation of some projects. Executive board - Composed of Cemeb chairman, its director and deputy-director, a representative for training issues, and the management team (project manager, two assistant project managers). Meeting once a week, the board is in charge of all daily management, including the meetings of the governance bodies, and of proposing a strategy and activities to the governing bodies. Each member is in charge of specific activities. The Executive borad coordinates activities, and implements Cemeb’s strategy and operations. It prepares documentation, initiates and monitors contacts with external bodies (supervisory bodies, institutional and non-academic partners, etc. ), manages operations, supervises calls for tenders, and manages financial and administrative initiatives implemented jointly with the University of Montpellier (the legal body responsible for the project).